SHOEPASSION.com was not created overnight. From the original idea through to the launch, it took us a long time to realise our dream. Visions gave way to new ones and are constantly replaced by other new ideas. Our impulse has always been the passion for our project, which unites the constantly growing team behind SHOEPASSION.com. An Internet expert who has ploughed his enthusiasm for the limitless possibilities of the digital age into various start-up projects. With the foundation of SHOEPASSION.com Tim, confirmed shoe lover and e-commerce fan from the very start, combined two of his great passions. Suddenly, a collection of shoes, which made even some women jealous, needed no further explanation. The passionate golfer with a penchant for perfectionism is inspired by a belief that e-commerce will change whole business structures. At SHOEPASSION.com Tim has optimised the organisational structure, guides the selection of software, plans and forms our wide range and is also involved in the product development – his favourite task. “Shoes are the only objects of art, whose value is never criticised”, explains Tim. His favourite Goodyear-welted shoe is our formal No. 562 and our exotic No. 460. Tim is working towards the day all his challenges are done with and he can finally start a round-the-world trip. The experienced merchant and offline-businessman completes our SHOEPASSION.com management. He is responsible for daily operations, purchasing and warehouse administration. After an intensive study of shoe literatures, his early interest in men’s shoes has grown into a real passion. As an offline expert, Henry guarantees that you can see SHOEPASSION.com not only day and night online, but also, in our Berlin store, whose doors have been wide open since November 2012. 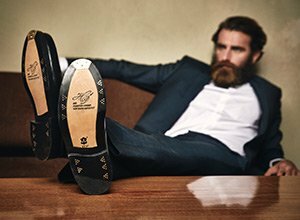 His favourite Goodyear-welted men’s shoes are elegant Oxfords, especially our No. 456. Besides his passion for high-quality footwear, he would love to spend more time on the golf course. Nobody knows the stories behind our traditional footwear as well as Tobias. Shoes are much more than simple everyday objects to our master of history and literature (who also graduated in publicity and communication) and freelance journalist. Reading up on shoe literature aroused his passion for Goodyear-welted footwear and laid the foundations for his ever-growing shoe knowledge. It proved to be a stroke of good luck for SHOEPASSION.com that the humorous all-rounder is not only able to juggle words, but also fulfil customer wishes brilliantly. Awestricken, he looks back at the masterly work of passionate shoemakers and is concerned about today’s lower quality footwear. Toby especially admires the elegance of the timeless cap-toe Oxford. If he is not writing about shoes, he enjoys to playing soccer (Hansa!) or playing with his young kids. Our manager in wholesale and export has already proved his business skills as a manager in the retail industry. At SHOEPASSION.com Dennis is the head of customer relations and deals with administrative tasks as well. He is fascinated by the individual development opportunities in e-commerce and the opportunities for attracting new customer groups. In keeping with his mission – educating men who wear nice suits with lower quality shoes –Dennis’ favourite shoes are our No. 577 for casual occasions, our No. 562 for more formal settings and the much-loved all-rounder No. 543. Dennis’ hero is Manfred Drexler, who whilst working for Adidas and the German Football Association helped he nation’s most famous footballers choose the right boots. When not watching Quentin Tarantino movies with friends, Dennis’ heart beats for sports, especially soccer. There is no problem, which Maximilian cannot find a fast and satisfactory solution to. Our passionate musician plays in numerous groups in his free time and brings the same passion to IT and online-marketing. He is also responsible for our ERP system “pixi*”. His relationship to our shop system is what you might call magnetic and was definitely love at first sight. Usually, when others are starting to panic in the face of a problem, Max is ready to step in and solve it. Max’s favourite parts of life at SHOEPASSION.com are the 24/7 shopping possibilities, the digital coverage and the technical challenges. Meanwhile he says our No. 380 and No. 562 are his favourite footwear, and cites Arthur Schopenhauer as one of his inspirations. When Max is not working on the search engine- and webpage-optimising of SHOEPASSION.com, he is brushing up his historical knowledge online. To call her SHOEPASSION.com’s little chap might not be her favourite nickname. But it is true that Nele is the youngest of all our team and had rarely had anything to do with men’s dress shoes before. The always-cheerful dog lover is a real all-round talent though and a vital part of company. Nele, who buys most of her clothes online, could never imagine life with the Internet. At SHOEPASSION.com she getting to know e-commerce from the other side of the counter and contributes to our success in customer service and customer management. Nele does not have one favourite shoe, but enjoys high-quality footwear in her free time as well as at work. When Nele is not listening to her favourite music or at the cinema, she is busy absorbing as much shoe knowledge as she can, to become a real shoe specialist one day. With a degree in business informatics in Leipzig, and as a former head of affiliate marketing, head of marketing, and Google adwords professional, Simon’s curriculum vitae speaks for itself. An Ostwestfale native with a Bavarian accent, Simon has already acquired an impressive level of experience in the e-commerce area. At SHOEPASSION.com the sympathetic all-rounder is responsible for marketing and is our man for all things statistics and analysis. Enjoying the rapidity, the innovation and the lack of bureaucracy in e-commerce, Simon loves working with high-quality products, which genuinely arouse customers’ enthusiasm. For pragmatic Simon, shoes are just the leather under his feet. But he does wax lyrical about the graceful lines of our contemporary No. 320. The former volleyball professional calls them, “A real masterpiece that is second to none”; praise Simon usually reserves for his much-loved children. Daniel is another man for numbers, statistics and analysis. After his studies, the Wuppertal native moved to Berlin and acquired his first experiences in the e-commerce arena. At SHOEPASSION.com, the qualified economist is responsible for operative and strategic control issues. The dynamism of Internet, the high-quality product and SHOEPASSION.com’s growing audience fills our numbers guy with enthusiasm: “You have to be fast and better than all the others, if you want to be successful. If you are, you can go very far,” he says. Goodyear-welted shoes meanwhile have become a great way for Daniel to stand out of from the crowd. He prefers our exotic No. 460, which provides even the dedicated soccer fan with a touch of fashionable extravagance. The man in our SHOEPASSION.com warehouse is Maik. With eyes like a hawk and impeccable attention to detail, he ensures each of our customers receive their new pair of men’s shoes as soon as possible. Of course he is supported by our ERP system, pixi*. Both work together excellently. Maik sees e-commerce as a seismic shift in retail, as offline business continues to pale in the face of competition from the Internet. As a passionate lover of sports footwear, Maik only wears leather shoes on special occasions. But on those rare occasions Maik shows a sense of style with the contemporary No. 381 and the exotic No. 458. When Maik’s hands are not full with shoe packages, he likes to read up on and discuss the latest science news. As SHOEPASSION.com’s trainee Julius is working with a desire to widen his experience in online-marketing and in particular optimising performance of our marketing strategies as well as our adwords campaigns. Since Julius discovered the world of Goodyear-welted men’s footwear, shoes have become much more than everyday objects for the native Berlin music lover. Now he is able to judge a man with only a look at his shoes. Although Julius admires Mark Zuckerberg (who can still be convincing in flip-flops), he prefers the classic elegance of our No. 532. A dedicated marketing man, Julius likes to deal with modern online-communication even in his spare time. One day he would like to combine his fascination for marketing with his second passion., music. Besides SEA, SMM, display or affiliate marketing Julius’ heart beats for music. In his home studio he lets his creativity take free reign and is always at home in the Berlin club scene. Claudia has already collected plenty of experience in several editorial offices. Now, the qualified literary academic is fine-tuning her style at SHOEPASSION.com, writing about men’s shoes, style and etiquette. She enjoys the rapidly changing nature of the Internet and e-commerce and the diversity it produces. For a long time Judy Garland’s red pumps topped the list of her favourite shoes, but now she prefers more subtle footwear. Although the modern elegance of our No. 560 impresses her, Claudia is patiently waiting for SHOEPASSION.com’s first collection of Goodyear-welted shoes for women. When not reading up on shoe literature, Claudia enjoys going to gigs or the cinema. SHOEPASSION.com has a lot of other hardworking helpers, without whom it would be impossible to realise our vision. We would like to thank all of our great writers, photographers, designers and friends. We are more than thankful for all your support, suggestions, work, fine words and of course corrections, too. Although we wish we could do everything ourselves, SHOEPASSION.com would not work without external service providers. From logistics to web hosting, technical support, interface management, or our marketplace activities – we expect a lot from our service providers and more than once, our wishes have posed new problems to solve. Reaching our goals has not always been easy and for this reason we would like to thank our service providers for their great support. We are extremely happy to create real innovation in partnership with them.